Blake attended the University of Wisconsin-Madison earning BBA degrees in Accounting and Finance. In May, 1977 he passed the Certified Public Accountant examination and was awarded his Certified Public Accountant certification in September, 1979. He is a member of the Wisconsin and American Institute of Certified Public Accountants. 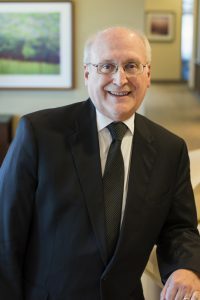 He has taught numerous accounting, tax and financial planning courses for the Wisconsin Institute of Certified Public Accountants (WICPA), Madison Area Technical College (MATC), and the Small Business Development Center of the University of Wisconsin. After graduating from college, Blake worked two years as a tax auditor for the Wisconsin Department of Revenue. He has been in public accounting since 1977. He joined Meicher CPAs, LLP in 1990 and became a partner in 1992. Areas of Specialized Knowledge: Blake specializes in tax, spending most of his time on small business and individual tax matters. He is also in charge of the estate and trust tax practice for the firm. Favorite Outside Activities: Attending and watching Wisconsin football and basketball games.